There was a moment where I wasn’t going to post this recipe. After all, there are a TON of lentil shepherd’s pie recipes floating around. It’s not exactly ground-breaking material. But then something happened… I pulled some of my leftover lentil shepherd’s pie from the freezer, warmed it up, and devoured the whole thing. So maybe there are a lot of lentil shepherd’s pies out there, but none of them are THIS recipe, and THIS recipe is Seriously The Best Lentil Shepherd’s Pie. I needed to publish this recipe, if for no other reason, but so that I can make it again, and again. 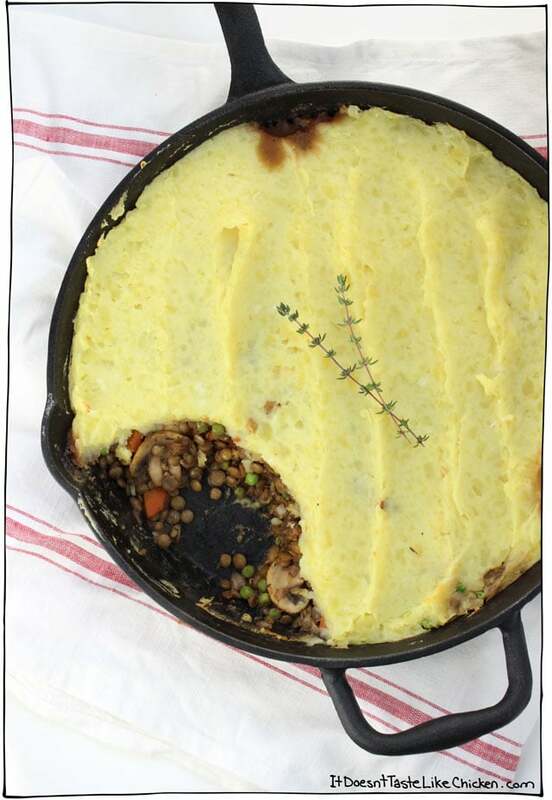 What makes this Lentil Shepherd’s Pie the best? Why thank you for asking. There are 3 simple and scrumptious reasons. These lentils are jam packed full of veggie deliciousness: carrots, mushrooms, peas, and are seasoned perfectly with thyme, onions, garlic, and an extra zing of BBQ sauce. Boom! Simple and totally drool-worthy. Garlic mashed potatoes. Those aren’t any plain old regular mashed potatoes, they’re packed full of garlic and creamy coconut milk making them light years above any other mash. This hearty meal is perfect for a holiday, weekend, or just something to last you throughout the week. It can be made in advance and then just warmed in the oven. You can serve it in a fancy casserole dish or go rustic like I like to do, and serve it in a skillet. This pie will satisfy anyone and everyone making it a perfect dish for any occasion! 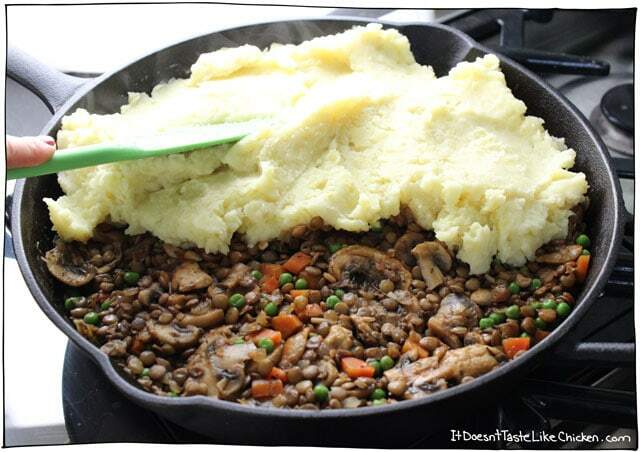 To make the lentil shepherd’s pie: chop up your veggies, and prep for the mash potatoes. Heat the oil in a large frying pan or skillet over medium-high heat. 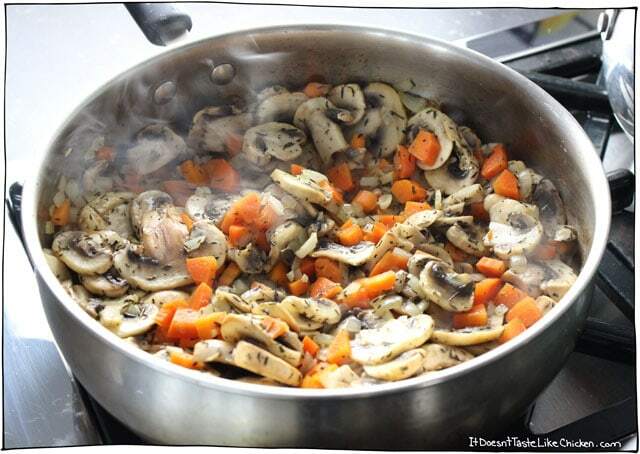 Add in the onion, carrots, mushrooms, garlic, and thyme and sauté for 6 to 8 minutes until softened and bits are browned. Remove from pan, and set aside. Return the pan to heat, add in the lentils, and vegetable broth. Cover, and simmer for 25 – 30 minutes until the broth is absorbed and the lentils are tender. While the lentils cook, prepare the mashed potatoes and try not to eat them all. When the lentils are cooked through, add the vegetables back to the pan, and add the peas, BBQ sauce, and soy sauce. Heat through. Scoop the mixture into a casserole dish or large skillet and then spread the mashed potatoes on top. 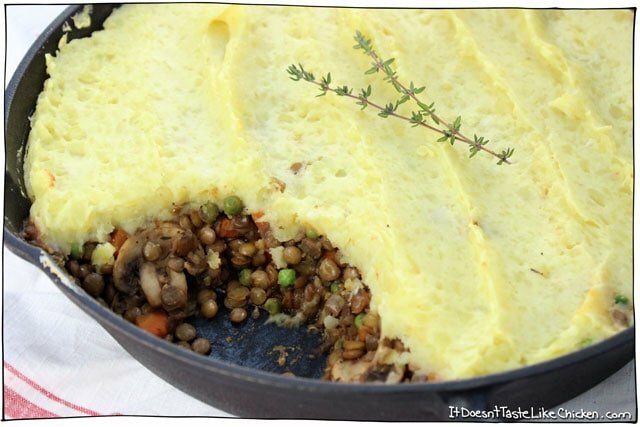 Bake for 10 – 15 minutes until the lentil shepherd’s pie is hot and bubbling around the edges. Perfect for the holidays or a hearty weekend meal. The garlic mashed potatoes take this from ordinary to extraordinary! Can be made ahead of time and reheated. Return the pan to heat, add in the lentils, and vegetable broth. Cover, and simmer for 25 - 30 minutes until the broth is absorbed and the lentils are tender. While the lentils cook, prepare the mashed potatoes according to the directions. Add the vegetables back to the pan with the lentils, and add the peas, BBQ sauce, and soy sauce. Heat through. Scoop the mixture into a casserole dish or large skillet and then spread the mashed potatoes on top. Bake for 10 - 15 minutes until the pie is hot and bubbling around the edges. For a quicker prep, you can use canned cooked lentils. Just drain and rinse before using and crumble 1 vegetable bouillon cube in with the lentils and stir to combine. My barbershop chorus has potlucks a few times a year. There’s another vegan (she’s also gluten free) and a couple vegetarians, so I’m always looking for recipes I can take to these dos. Homerun of a recipe again! Merci Madame! I just made this recipe and it turned out delicious! Thank you for sharing it! Hi- do you think this would work with your baked tofu from your chilli recipe.? I am obsessed with it. Or am I overdoing it? Haha! So happy you’re obsessed with it. I’m sure it would work great although the recipe would need a little tweaking to be perfect. Feel free to experiment! Enjoy! my 6year old just gave this 2 thumbs AND 2 toes up! AND asked to have it as her school lunch tomorrow !!!!!! (she NEVER takes leftover for her school lunch – it is a sandwich everyday) so this is a MASSIVE compliment! and she did not dawdle eating it either! Is there a substitute I could use for BBQ sauce? I’m really not a fan of that stuff at all. You could try ketchup. Enjoy! I’m about to have a baby and filling my freezer with some meals. Do you think this would freeze well? And my fam doesn’t do mushrooms, do you have any suggestions for a different veggie to replace them? Thanks !! Hi Britney! From my experience, potatoes don’t freeze that well, but apparently mashed potatoes freeze a little better. 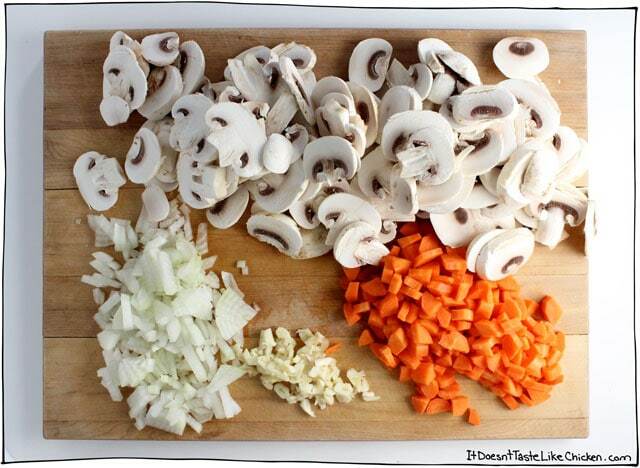 You can just skip the mushrooms. Enjoy! Chose this recipe as my first vegan dish for a guest coming to my Christmas brunch. When I cooked the lentil filling, I initially thought it was too much thyme. But when I tasted both the vegan mashed potatoes and the lentils together, the flavors really melded together nicely!! I added a little extra bbq sauce for a little more kick. It was a hit among all of my guests!! Thank you for sharing this recipe Sam!!! I made this for lunch at our Temple’s service day. I quadrupled the recipe. Very well received! A big hit!! Hi! I don’t see the link to make the mashed potatoes and I can’t find it by searching your site. Can you please help me find that recipe? Thank you! Here it is. Just scroll down a little. Hi! I hope to make this recipe either tonight or tomorrow night. I have canned lentils so if I’m substituting with those instead of dried lentils, how much vegetable broth do I use? I assume not three cups otherwise it’ll be too soupy. I have a vegetable bouillon cube to add for flavour as per your suggestion. Thanks! You can skip the vegetable broth and just add the cube. The raw lentils would soak up all of the broth when cooking. Since yours are cooked, there is no need. Enjoy! Thanks, Sam. That’s wxactly what I did. It was very tasty! Absolutely delicious! I didn’t make the mashed potatoes vegan, but this is my new favorite dish. Love the bbq sauce in it. Thanks! So happy you enjoyed it, Cindy! VERY GOOD!!! Husband jokingly said “don’t ever make it again,” then practically licked the plate clean! I reduced the recipe to 2 servings and we didn’t have quite enough potato for the top. And dishing it out was a little messy, so I’m thinking individual skillets next time! Definitely a winner! Thanks Sam!! This isn’t the best lentil shepard’s pie. It’s the best shepard’s pie, period. I was concerned it would be bland but it had alot of flavor without the heaviness of beef. The only modifications I made was that I added a cup of frozen veggies and I put in an extra couple garlic cloves. This is my new go-to recipe! Hi Sam, I’m a bit confused, In the video, you use 10 cloves of garlic. in the recipe, you use 4. Did you not include the 6 you used in the mashed potatoes? Just making sure I saw it right. Thanks. Hi Michael, the mashed potatoes recipe is on a separate page on my blog and as linked in the recipe. So that’s where the extra 6 cloves of garlic are (along with the non-dairy milks and other ingredients for the mashed potatoes). Hope that helps clear it up! Can you recommend a BBQ sauce that you like/use? Btw- I Love your site!! Thanks Joni! My go to is the BBQ sauce in my cookbook, but when I am feeling lazy I usually buy Stubb’s brand. Hi sam, would love to make this but I don’t really have any vegetable broth to hand nor do I have the bits to make it. I’m new to this as well. Would you be able to recommend a store-bought alternative please? Would help with some of your other recipes as well. Thanks! Hi Sam! 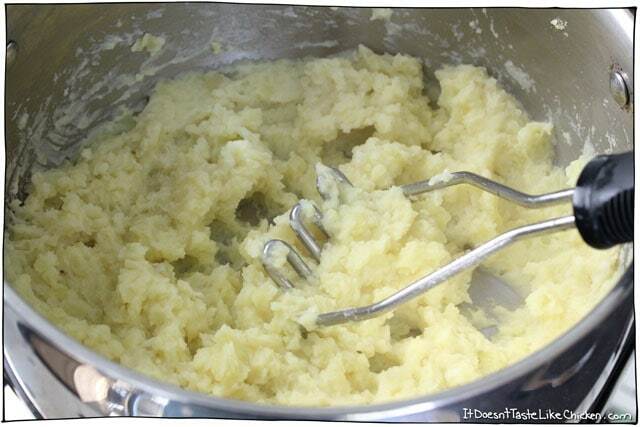 Perfect recipe!Very good mashed potatoes! In Québec, we add a can of cream corn between the layers of “meat” (or lentils), and potatoes. Its called a “pâté chinois”. Its delish ! I made this over the weekend, and it turned out very dry. What did I do wrong? It’s difficult to know without being in the kitchen with you, but it sounds like you might have overcooked the lentils so the moisture was all sucked up. Either way, feel free to add a splash of vegetable broth, water, or BBQ sauce in the future to moisten it up! 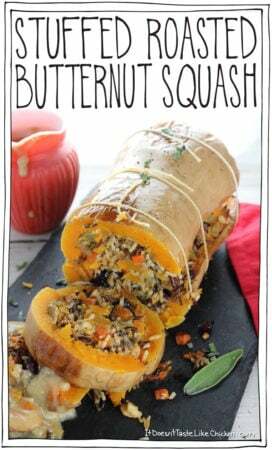 I’d like to make this and freeze it for a quick weeknight supper. Amy tips? Do you think I should skip the last step or cook per the recipe and just reheat? Thanks! Sounds like a great plan! Enjoy! My 12 year old daughter is learning to cook and this was a huge hit with the family when she made it! Made this a few times. Once for my husband and I, and last night for my non-vegan parents. They loved it! The only thing I changed is that I used roasted garlic both times for the potatoes, but next time I’m going to try it your way. Thank you SO much for this recipe! Just made it for the first time ever and it is absolutely amazing!!! Will definitely be making again soon. I followed the recipe exactly except I made a double batch of your garlic mashed potatoes and put extra on top. Your site has become my go-to on a daily basis. I have tried many of your recipes over the last few months, and I have to say that EVERY single one of your recipes have been amazing! I served this last night to my boyfriend and roommate and they couldn’t get enough! 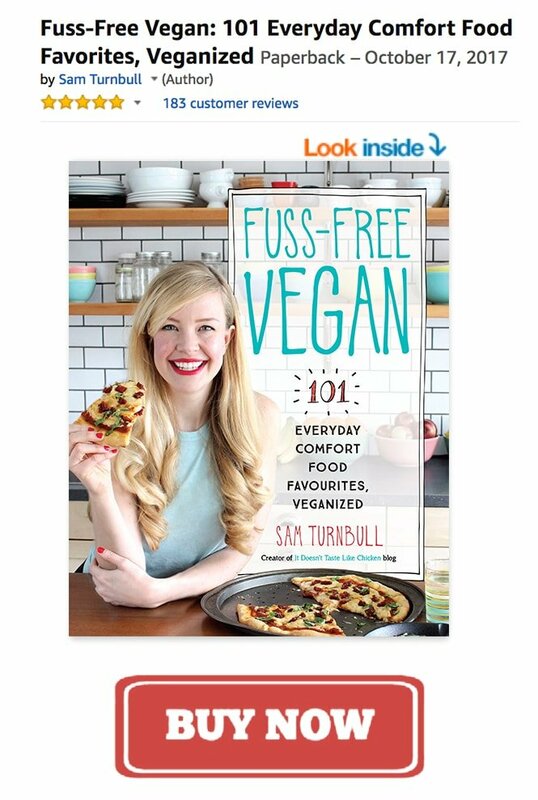 Thank you for making it so easy (and delicious) to cook vegan! This is seriously so delicious. I left out the soy sauce, on purpose and it was yummy without it. I think I would add french green beans and more of the vegetables next time, such as carrots. Thank you for sharing this absolutely delicious recipe. I wish I could share my photo of this delicious dish. Hi, Sam — Really need your help! I’ve made this recipe 3 times so far, and it’s turned out well, even though I’ve fudged a little on the quantities of some ingredients. This time, for a potluck, I’m going pretty much exactly by the recipe……. BUT 16 oz of chopped mushrooms seems like a lot, by weight. Can you specify if it is ounces by volume or weight that you intend? It doesn’t look like a pound of mushrooms in the pics. Hi can i use red lentils too? Thanks! Red lentils are a lot more tender, so I would be a bit worried that they may turn out mushy in this recipe. You can try to replace them but they take only about 10 mintues to cook with the broth, so make sure you take the cooking time way down. Enjoy! Wanted to know what kind of barbecue sauce that you use in you recipe? Thanks! Made this lentil pie this evening & was absolutely delicious! I am vegetarian but my partner eats meat. He was very impressed & we will definitely be making it again. I can’t wait to try some more of your recipes! Thanks for sharing! My first lentil pie and it was deliciuos! Thank you for sharing, I will be making this often. You can use cashew milk instead of coconut milk. I did that and it was fine. I’m new to your website and I’m loving it what I see. Great content! Currently waiting for this to come out of the oven. I can already tell it’s going to taste delicious based on what I’m smelling. I’m trying to reduce our household’s protein intake via meats, your recipes are making me question why I didn’t make the change sooner! Hahaha love it! So happy you are enjoying my site. I hope you love the shepherd’s pie! The most common thing I hear from vegans is that they wish they went vegan sooner, so I am not surprised you are feeling the same way about reducing animal products. Welcome to my blog, Tina! Seriously … I can’t believe how good this is. On reading the ingredients, I thought it would be “ho-hum” — but I flipped, and so did my carnivore husband. My husband’s new year’s resolution was to eat vegan at least 4 days per week, and more if possible. We tried your lasagna and LOVED it. The “ricotta” is amazing! Unfortunately, he hates mushrooms (and it’s not a matter of him getting used to them, he tries them frequently and just doesn’t enjoy them). Is there anything we can sub for mushrooms in this recipe? I was thinking I could do cauliflower, because we have some extra in the fridge. Maybe a splash of red wine to make the taste richer? Thanks! Hi Sarah! What a great goal. No problem at all, some people just don’t love mushrooms and that’s a-ok. You can choose to leave the mushrooms out of this recipe or replace them with another veggie of choice. I think cauliflower would be fine. Enjoy! I’m making this for guests and the wife is allergic to soy. What could I sub for the soy sauce? Should I just a bit of salt to taste? I thought about vegan Worcestershire Sauce but it also has soy. The recipe looks delicious and I can’t wait to try it! Yes, salt will work. Enjoy! Absolutely loved this! 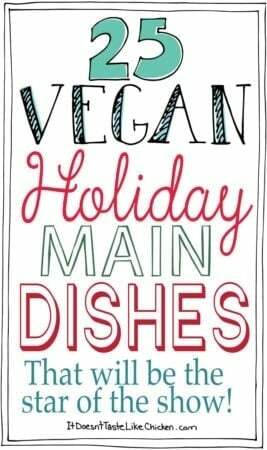 Your blog has kept us happily vegan fed for months now. No one believes how easy it is for us to be vegan. If they only knew! Thank you! I made this today and it was delicious. Thank you for sharing it! It was very easy to make and flavourful. Hubby and I really enjoyed it. I just made this tonight for my first ever fully vegan meal. It is super delicious and I will be adding this to my staple recipes. I felt like the time to cook it may have took a little longer than I had expected but I also like to cook my carrots to the point they’re soft. The vegan mashed potatoes were awesome as well. I look forward to making more recipes. Do you think substituting cauliflower or sweet potatoes for the white potatoes would be good? 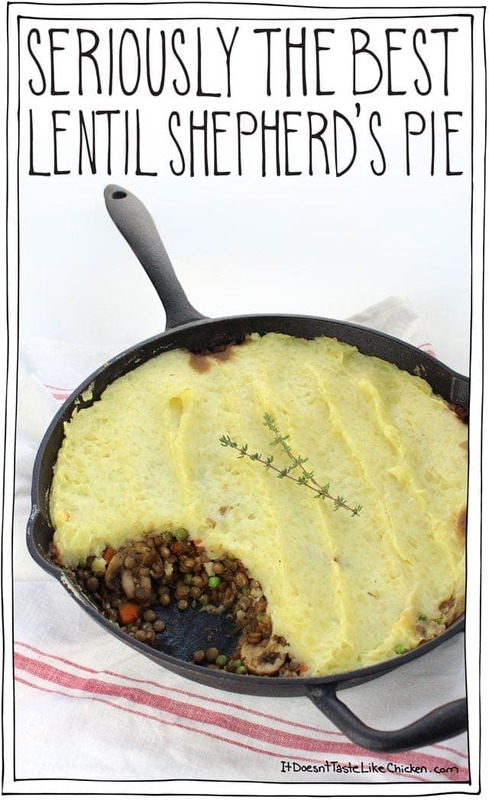 I’m allergic to white potatoes and I’ve been craving a vegan shepherds pie!! This one looks great!! Hi Lynndel, Thanks so much! Yes, I would try a garlic cauliflower mash. 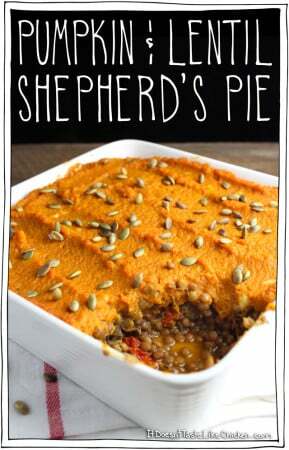 Sweet potato would work well too, but might add too many flavours as the lentil mix is already flavour packed. I hope you enjoy it! Second time making this dish within the month! I found this recipe while searching for some red meat alternative meals for my carnivorous family and honestly it’s so lovely I think I prefer it to the original. Love your page, thank youuuu! I’m not sure what is meant by “adding the vegetables back to the pan.” I’m confused; when was there an additional pan added to the instructions? I made this for dinner tonight and it was a hit with the whole family! I’m always looking for recipes that aren’t too complicated for easy weekday meals. This was fantastic!!!! Today is day one of my 30 day vegan challenge, and this recipe stood up to my unadjusted palate! I made it last night and had it today for lunch; it reheats perfectly. I really think it’s the mashed potatoes (I followed the recipe for those as well) that make it so good! I’m so glad I tried this recipe first, it’s given me hope that I will not only survive the 30 days but will enjoy it! 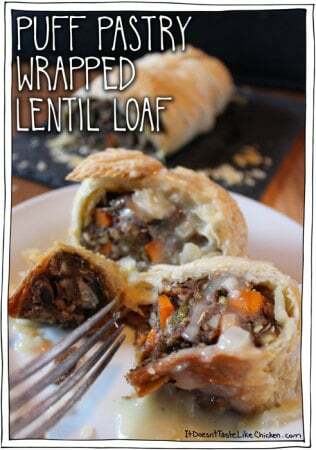 Hi Sam just stumbled over your blog and this looks delicious! You mentioned in the led up to the recipe that it freezes well, is this for the whole pie including the mash or just the lentils? Thanks a ton for this lovely looking recipe! Yes, you can freeze the whole thing. Just thaw, then reheat in the oven. Enjoy! This was absolutely delicious, but I found that the potatoes changed texture after freezing. Could the variety of potato be the problem? I can never find Yukon Gold (I live in Ottawa), so I subbed Russet. Any suggestions? Yeah, frozen potatoes do change a bit in texture. Russets are a bit grainier so I imagine the freezer might make them even grainier. Try a waxier potato next time, that might work better. Hope that helps! Made this and LOVED IT. Those mashed potatoes are my new go-to. For sure. Why didn’t I think of BBQ sauce sooner? So simple yet gives it such a huge hit of flavor! I used canned lentils and you know what? I completely forgot the bouillon cube and it was still delicious. Made this last night. So, so good! Not missing meat at all! Preparing the vegetables made me eager to taste it! I very rarely comment on recipes, I usually just enjoy and move on… BUT this was sooo good I had to come back and say so! I also used your recipe for the mashed potatoes (if you didn’t say so already, you may want to tell people to cook more than the recipe calls for because I could not stop eating while preparing the lentils and veggies!) yum!! I used a copy cat recipe for my fav bbq sauce, OMG… My only suggestion is that if a person really likes bbq sauce, up that to 1/2 to 3/4 of a cup! Soooo good! Thank you! Oh My Gosh! Seriously the best dish ever. And I’m Italian and have never made Shepard’s Pie. This was delicious and my whole family loved it. I’m so excited I have a recipe that is plant based and can be made as a casserole that I can make for my non-plant family and friends. I put a post on my instagram page about my love of this dish. Thank you so much! Not sure I tagged you correctly on my Instagram post. @bonappetegan? I just recently came across this blog. I don’t even remember what I was looking for. I signed up for your emails and was intrigued by this lentil recipe. O.M.G! this is A.M.A.Z.I.N.G! For BBQ sauce, I used sugar free salsa and for soy sauce, I used liquid aminos. I also did half cauliflower, half potatoes to make mashed potatoes. Great idea using cauliflower. After I saw the 75 carbs, I just did the “diabetic sigh of disgust”. Dr. Barnard is my guru and he would vote thumb’s up on your pie, and a double thumb’s up for the cauliflower/mashed potato combo. You rock! I MADE IT!!! It was fantastic! I also made cauliflower “mashed potatoes” and finally told my husband “It’s delicious cauliflower, but don’t try and pretend it’s potatoes.” So….it was your pie, but without a topping. The next day, I mixed macaroni into it with spaghetti sauce and called it “Meatless Hamburger Helper”. LOL THANK YOU! Your awesome Sam! Thank you so much for this recipe. This shepards pie was incredible! I haven’t had shepards pie in so many years and was on the hunt for a good recipe. Definitely one of my top favorite vegan meals ever! I also made some homemade sweet vegan BBQ sauce and spread it on top of my shepards pie. So delicious! Keep up the good work my friend! Great recipe Sam! Made this last night – made TONS! I took the cue from your pics and just baked it in the Cast Iron pan… super simple. Love the flavours, and the addition of BBQ sauce… thumbs up on that, because, well, any excuse to use BBQ sauce. For the person who inquired about vegan BBQ sauce, we also use the PC brand (specifically the Smoking’ Stampede sauce); but it is so easy to make too. thinking maybe 1/4 teaspoon to start. Anyone else think the thyme was too much? Oh I’m sorry to hear that. Was your thyme ground perhaps? I used dried thyme leaves which would be much less intense than ground. This recipe is amazing! My family–and my kids’ friends–all devoured it. I’ve already shared the recipe with friends. Your recipes never fail me. Thank you!! You mention adding BBQ sauce, since going vegan I haven’t been able to find any I like. What brand do you use? I actually often make my own since I find it tastes so much better! I have a recipe for BBQ sauce included in this recipe. Otherwise, the brand I currently have in my fridge is Presidents Choice which is a Candian brand. Nothing particularly exciting about it, however. Hope that helps! 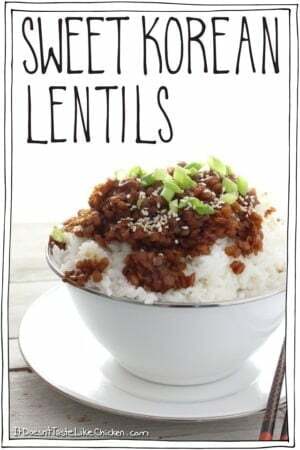 I want to make it because my cupboard is bursting with lentils. But I only have one cup of green lentils and the rest are red lentils. Can this still work? Or are red lentils too tender? Red lentils will cook a lot faster than green lentils (in only about 10 minutes). 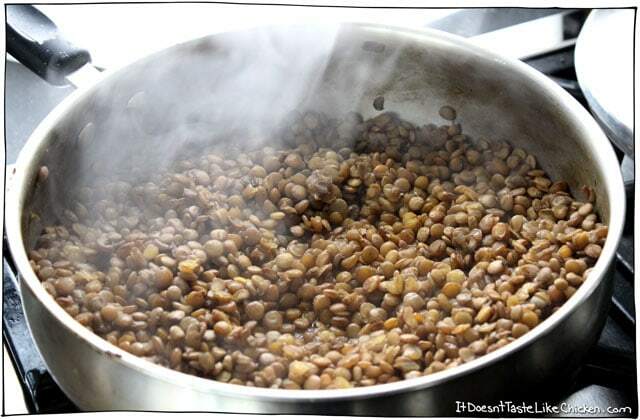 You could try to cook the green lentils for the first 15 to 20 minutes and toss in the red lentils for the last 10. It might be kind of an experiment, but it could work! Or if you wanted to use all red lentils just cook them for only about 10 minutes. They could work ok, but they might get a bit mushy. Hope that helps! You know what, I’m gonna buy more green lentils. But I also need a recipe for yellow split peas. Have tons of them as well. LOOOOOVE this! I just made and it’s amaaaaaaazing!! Your recipes have never let me down and this one is no exception! Yay!! Love that you made it so quickly Sofia 🙂 and ever more thrilled my recipes never let you down! That is one good recipe, thanks for posting, just made it and it,s delicish!